Awards: Nominated for 2 Oscars. Another 13 wins & 47 nominations. 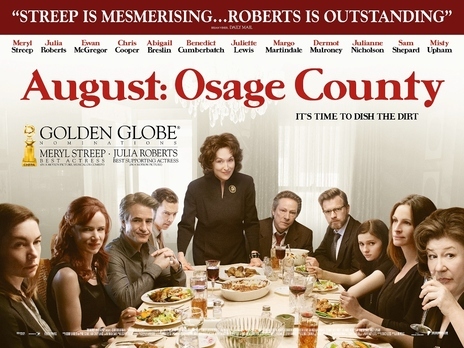 After years of living with his wife Violet in Osage County, Oklahoma, a wife who has cancer and a propensity for pills, Beverly, a noted poet and alcoholic husband, goes fishing and then commits suicide. Violet's family must come together from all parts of the country for the long weekend of funeral events. Her sister, brother in-law, and nephew are local, as is one of her daughters, but the rest arrive with their families and significant others from all over the country. The tragedy reveals secrets the women in the family kept but now must reveal and examine, whether they want to or not.